NewTek LightWave 3D Group announces ChronoSculpt: Time-Based Cache Sculpting for Every 3D Software Pipeline. 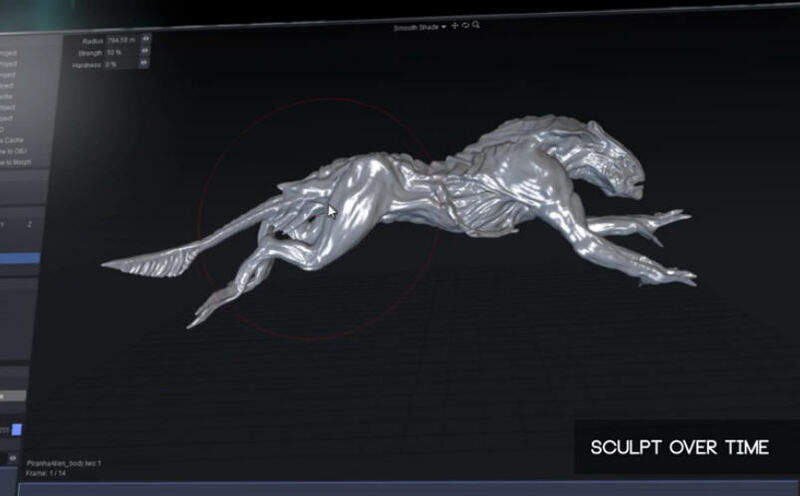 It is a powerful new stand-alone application that revolutionizes working with animation and dynamic simulation cache files from any application by allowing you to use sculpting and transformation tools over time. ChronoSculpt also introduces a radical new geometry engine based on our “Hydra” technology which allows the deformation and manipulation of 8 to 10 million polygon objects with ease. ChronoSculpt also allows you to export any frame from your sculpt or deformation direclty to a LightWave endomorph or OBJ object file (for blend shapes in Autodesk Maya). -Enhanced Geometry Engine: Handle massive geometry files, 8 to 10 million polygon objects can be edited with ease. ChronoSculpt could potentially save you hours of work by allowing you to quickly make changes to the baked dynamic simualation cache files to address simulation jitter, soft body penetrations, or to remove stray simulation pieces and get the shot out the door.